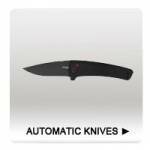 CobraTec Knives introduces our new Black Mamba OTF (out the front) automatic knife. High-Quality CNC Machined T6061 Aircraft Aluminum Handle with a D2 steel blade. All CobraTec Knives are backed by a LIFETIME WARRANTY. 9.5 inches in total length with glass breaker. 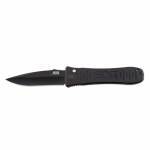 5.5 inch handle 4 inch blade Note: Automatic Knives are not legal everywhere. Please be responsible, and check your local laws for the legality of automatic knife ownership/possession before ordering. ..
Every CobraTec OTF knife handle is made of zinc-aluminum alloy covered in a slip-resistant grip.. Every knife has a silver/black 440C stainless blade. Customize your CobraTec knife by choosing the handle color, point style, and blade edge! Every knife features a pocket clip engraved with our logo, a glass breaker for emergencies, and includes a nylon sheath. 8 inches in total length (including the glass breaker), 5 inch zinc-aluminum alloy handle, 3 inch 440C stainless steel blade (every b..
Every CobraTec OTF knife handle is made of zinc-aluminum alloy covered in a slip-resistant grip.. Every knife has a silver/black 440C stainless blade. Every knife features a pocket clip engraved with our logo, a glass breaker for emergencies, and includes a nylon sheath. 8 inches in total length (including the glass breaker), 5 inch zinc-aluminum alloy handle, 3 inch 440C stainless steel blade (every blade style), Weight 4.5 ounces. Note: Automatic Knives are not legal everywhere. Ple..
CobraTec Fang FS-3 knife handle is made of zinc-aluminum alloy covered in a slip-resistant grip available in a variety of colors. Our Fang FS-3 knives come with a CNC Machined USA grade D2 steel blade and is available in 7 different blade options. Our Fang FS-3 might look the same as some of the others on the market, however, do not be fooled. We have engineered and redesigned our FS-3 to have tighter tolerances with all internal parts CNC Machined to our specifications. Our Fang FS-3 will ou..
Every CobraTec OTF knife handle is made of zinc-aluminum alloy covered in a slip-resistant grip. Every knife has a silver/black 440C stainless blade. Customize your CobraTec knife by choosing the handle color, point style, and blade edge! Every knife features a pocket clip engraved with our logo, a glass breaker for emergencies, and includes a nylon sheath. 7 inches in total length (including the glass breaker). 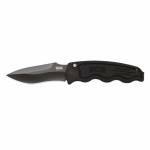 4.25 inch zinc aluminum alloy handle 2.75 inch 440C stainless steel blade, Wei..
Like the Pentagon and Spec Elite series, the SOG-TAC series is designed as a backup and go-to tool for military and law enforcement personnel. For years, we have been asked to produce a tactical switchblade. After vigorous design, engineering, and testing, the SOG-TAC is born. OVERALL LENGTH 8" CLOSED LENGTH 4.5" PRODUCT WEIGHT 3.80 OZ BLADE LENGTH 3.5" LOCKING MECHANISM AUTOMATIC OPENING MECHANISM AUTOMATIC BELT CLIP TYPE REVERSIBLE FINISH HARDCASED BLACK TINI EDGE TYPE STRA..
"Just good enough" and "too fast" are not words in our vocabulary. Producing top-of-the-line products for professionals is what we do. The Spec Elite series is one go-to blade when things get serious. 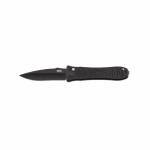 AUS-8 Stainless Steel Hardcased Black Tini Finish Clip Point Weight: 2.8 oz Length: 7.8" Blade: 3.5" Handle: ANODIZED ALUMINUM 6061-T6 This is an Automatic knife and is not legal everywhere. Check your local laws before ordering. .. 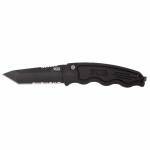 The SOG-TAC is an invigorating new design is big, but relatively slim, and specifically tailored to the professional tactical users. The blade travels very fast and once open, it locks up very securely. The 6061-T6 hard-anodized aluminum handle is machined with insets for increased grip and control. It has a safety button that can either lock the blade in the open or closed position. The SOG-TAC should go with you everywhere with the reversible low-carry clip. AUS-8 Stainless Steel Hardc..